Added by Deborah Baber-Savalla on November 11, 2018. 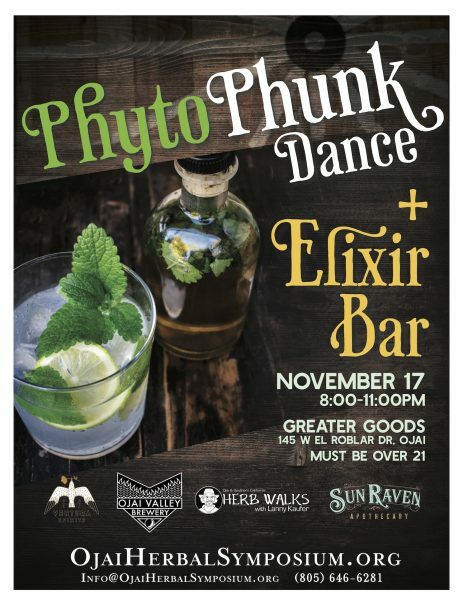 The Ojai Herbal Symposium will host a PhytoPhunk Dance & Elixir Bar on Saturday night, November 17, at 8 p.m. at Greater Goods in Meiners Oaks in support of the nonprofit’s Relief Fund, dedicated to those in the Ojai area affected by the Thomas Fire of December 2017 who have significant losses and little support. In addition, a portion of all proceeds from the Symposium will go to that fund. Herbalist Jess Starwood of SunRaven Apothecary will serve herbal cocktails crafted with ingredients from distillery sponsor, Ventura Spirits. The Ojai Valley Brewery will add one of their signature locally-sourced herbal ales to the event. Dance tunes from the golden age of funk will keep everyone moving. Symposium attendees signed up for the full weekend will be special guests and the event will be open to the general public 21 years of age and older by donation at the door. Greater Goods is located at 145 W. El Roblar Drive in Meiners Oaks. The Ojai Herbal Symposium is presented by Herb Walks with Lanny Kaufer and will take place from Friday, November 16 through Sunday, November 18 at Krotona Hall and other Ojai venues. For more information, visit OjaiHerbalSymposium.org.